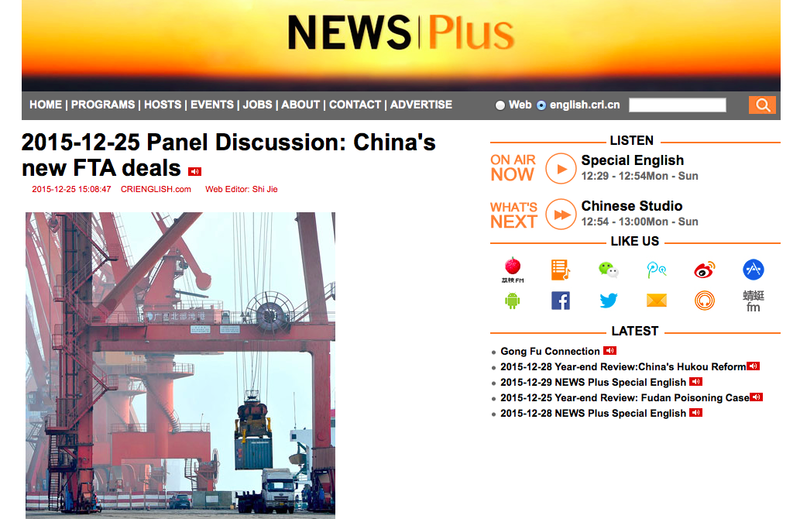 "Panel Discussion: China's new FTA deals"
Description: Earlier in December, China launched new free trade agreements with Australia and South Korea. The accords are widely seen as two of the most significant that China has reached with other countries, and could provide a boost to China's trade at a time of falling exports and imports. For more on this, Zheng Chenguang and Michael Butterworth talk to: Chin Leng Lim, Professor of International Economic Law at the University of Hong Kong, and Cheng Dawei, Professor at the School of Economics and Renmin University of China. Click here to listen to the interview.